When we created new content for Baldur’s Gate: Enhanced Edition and Baldur’s Gate II: Enhanced Edition, we had to develop new areas for your hero to explore. Creating new content for the Infinity Engine isn’t easy due to its complexity, but it all starts out with some squiggly lines scrawled on a whiteboard. After an initial text description is developed by a writer, a team consisting of artists, writers, technical designers, and the project lead meet to discuss what function the area is to fulfill. Should it be crammed with wandering monsters? Should it contain any buildings? 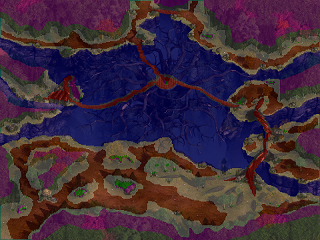 Will we need a transition to a related area, such as a cave? Do the writers have quests in the area that require specific background elements, perhaps an old dead tree or a dragon skeleton draped atop a castle? We decide on those details and make a rough sketch of what the area should look like. One of our artists takes a look at our poor, pitiful whiteboard markings and weeps for our lack of talent. Then they mock up the area at the size it will appear in-game with a black-and-white sketch. This sketch doesn’t contain much detail, but it does lay out how we want, say, forested areas, tunnels, or a cliff face to be positioned. We can take this sketch and import it directly into the game to get a sense for the scale and location of elements. The project lead reviews the sketch and makes notes on how the design is shaping up. We make significant changes at this point before any really involved work is done. Notes might say things like, “move these barricades right to block off the courtyard”, “Inlay the symbol of Bhaal on the floor of this circular room”, or “what the heck is this supposed to be? A dragon? Who drew this, it was Amber, wasn’t it?” When the design has been approved, a final colored concept is created and the 3D version begins construction. Our 3D artist takes the hand-drawn concept and, using it as a template, blocks out the area in basic grey shapes. Next they extrude walls and other large details. The artist creates progressively more detailed versions of the area, adding individual objects like beds, sarcophagi, bookshelves, and things that are obviously dragons. Writers may submit requests during this process when they realize they need some coffins and could we add three or four at the last minute? Yeah. Sorry about that. Finally a lighting pass is made to highlight some areas and create shadow in others. Poor lighting can ruin an area, and the artist spends a significant amount of time placing light sources and ensuring that objects aren’t casting unfortunate shadows or obscuring key parts of a map. Finally when all the elements are complete, a traditional 2D artist highlights and defines the area with a final layer of detail called overpainting. This makes the area pop in various places, adjusts the color level, and really highlights the parts of the area we want to show off. After this point, the writers are out of luck if they forgot they needed a giant troll cage there. Now that the art is finished the hard part is over, right? Nope. Implementation is a complex and detailed process that is critical to the game. The most challenging aspects of implementing Infinity Engine areas once is the art is done are pathfinding and wall polygons. A technical designer (Typically Lorne) adds the area artwork to the game and defines the edges of objects and impassable areas, so a character can’t walk through walls or tables. 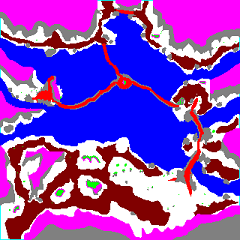 An image of impassable areas is called a search map, and allows the technical designer to complete the pathfinding. Next comes wall polygons. Much of this process is being automated, but there's still a lot of fine tuning by hand. Because locations in the game are 2D images of 3D environments, a technical designer must define the places where a character can appear to go behind a wall or other obscuring element. For example, if your character walks behind a boulder they become partially obscured, that’s because they are behind one of the wall polygons but still within the walkable area of the search map. Doors are surprisingly complicated in the Infinity Engine. If you’re ever wandering around Athkatla and wonder why no one has doors on their bedrooms, it’s because the time required to implement closeable/openable doors is much better served adding cool content to the game. Doors must account for lighting changes in the nearby environment when they open and close and have complex interactions if multiple doors are near one another. As part of implementing the doors, the technical designer also adds area transitions points so that maps properly connect to other maps. 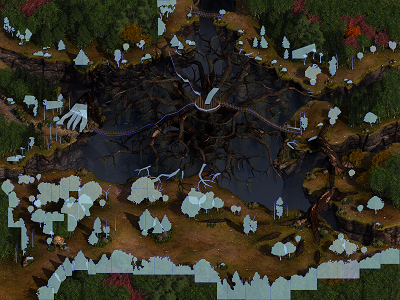 Adding an area to a game is no small matter. Our artists and technical designers work hard to create the most dynamic, beautiful, and bug-free areas they can to make the game come alive. Share your thoughts on area design on our forums, or tweet us at @Beamdoginc.